In addition, 29% of cell owners who use text messaging have used their phone recently to exchange text messages with someone else who was watching the same program in a different location (since 79% of cell owners use text messaging, that means that 23% of all mobile users have done this). Cell owners living in households earning $50,000 per year or more are more likely to participate in interactive television experiences than those in households with lower annual incomes, and those with at least some college experience are more likely to do so than those who have not graduated high school. African American cell phone owners participate in connected viewing experiences at a somewhat greater rate than their white counterparts (59% vs. 50%), and urban residents are more likely to do so than those living in rural areas. Along with these demographic differences, smartphone owners use their devices to interact with televised content at far higher rates than owners of more basic cell phones. Fully 74% of smartphone owners reported using their devices in one way or another while watching television in the preceding 30 days, compared with 27% of non-smartphone owners. 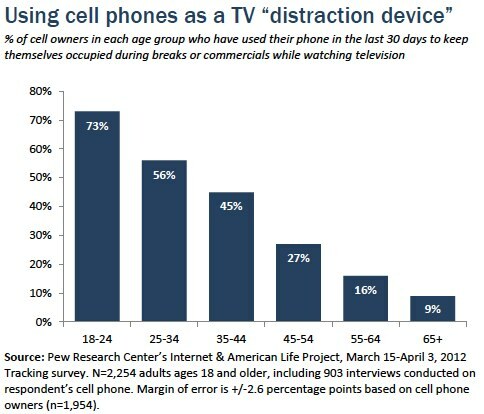 Young adults are especially likely to use their mobile phones to keep themselves occupied while watching television, as nearly three quarters of all cell owners ages 18-24 (73%) used their cell phone in this manner recently. But while this behavior is especially common among the youngest cell owners, a majority of 25-34 year olds and just under half of those in their mid-30s to mid-40s have done this recently. Outside of these age differences, most cell owners are equally likely to use their phones for “distracted viewing” regardless of demographic characteristics. Educational background is a modest exception to this rule, as mobile users with at least some college experience are somewhat more likely to use their phone as a distraction device compared with those who have not attended college (42% vs. 34%). 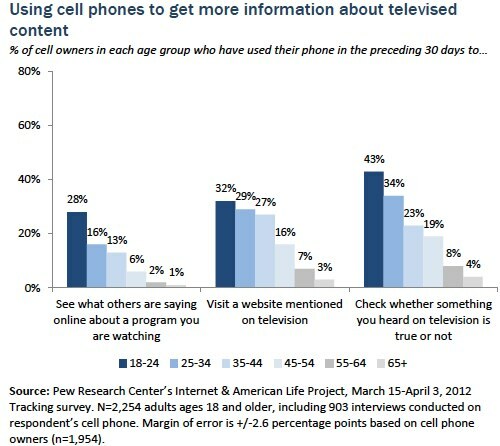 Cell phones allow viewers to engage more deeply with televised content by letting viewers seek out additional information or commentary about programming that interests them. This includes activities such as using one’s mobile device to visit a website mentioned on television (20% of cell owners have done this recently), checking whether televised statements are true or not (22%), or going online to read the opinions of others watching the same program (11%). Overall, 32% of cell owners used their mobile devices in the 30 days preceding our survey for one or more of these reasons, and cell owners under the age of 25 have high levels of engagement in each of these activities. At the same time, using one’s cell phone to visit a website mentioned during televised programming is relatively common with older cell owners as well—engagement in this behavior does not drop significantly until approximately age 45. Non-white cell phone owners also stand out when it comes to using their phones to engage more deeply with information they have seen on television. African-American cell owners are especially likely to say that they have used their phone recently to see what others are saying online about a program they are watching (28% of African-American cell owners have done this recently, compared with 8% of whites and 12% of Latinos). And both black and Latino cell owners are more likely than whites to have recently used their phone to fact-check something they heard on-air. Some 33% of African American cell owners and 30% of Latinos have done this in the preceding 30 days, compared to 19% of whites. Multi-screen experiences also allow audience members to connect directly with programming content—and to others who are interested in the same content. 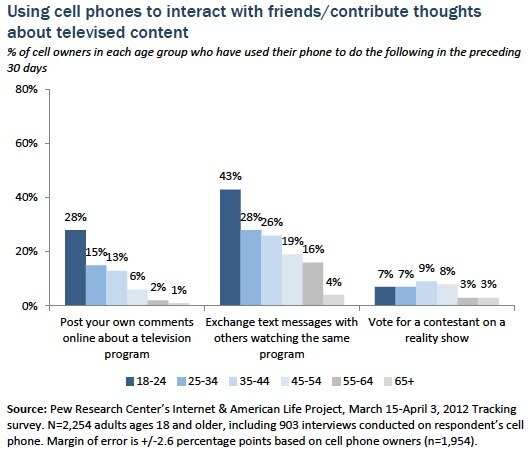 In our survey we examined three of these interactive behaviors: texting someone else watching the same program in a different location (23% of cell owners have done this in the last 30 days), posting one’s own comments online about a program (11% of cell owners have done this recently) and voting for a contestant on a reality show (6% of cell owners have done this). 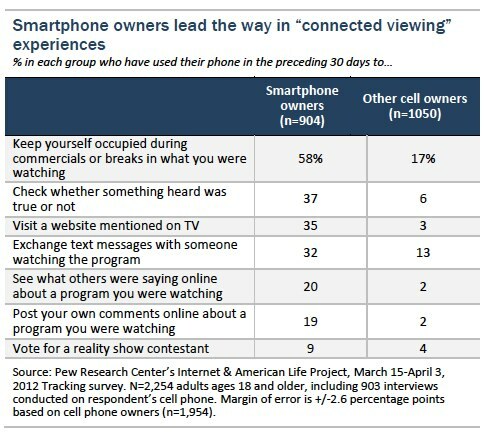 As we saw with the other connected viewing experiences discussed above, younger cell owners are more likely than their elders to engage with others around televised content. This is especially true for posting one’s comments online and for sharing text messages with others watching the same program—for each of these activities, the youngest cell owners (those ages 18-24) stand out even compared with those just a few years older. 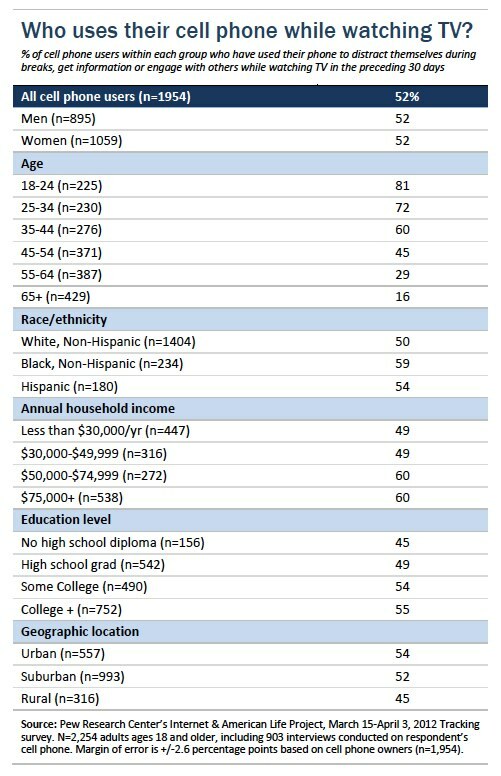 Similarly, African American cell owners are more likely than whites or Hispanics to exchange text messages with others about a program they are watching (35% of black cell owners have done this recently, compared with 24% of Latinos and 21% of whites) and are more than twice as likely as other groups to post their own comments online about a program they are watching (25% of black cell owners, 10% of Latinos and 8% of whites have done this). While women and men are equally likely to be connected viewers overall, female cell owners are slightly more likely than men to engage in individual activities such as sharing text messages with others during televised programming (25% vs. 21%), posting their own comments online about a show they are watching (13% vs. 9%) and voting for a contestant on a reality show (8% vs. 4%).